If life and history are cyclical, Rug with Grass, 2012, created in conjunction with BravinLee Programs, references the phase when desolation turns into rebirth. 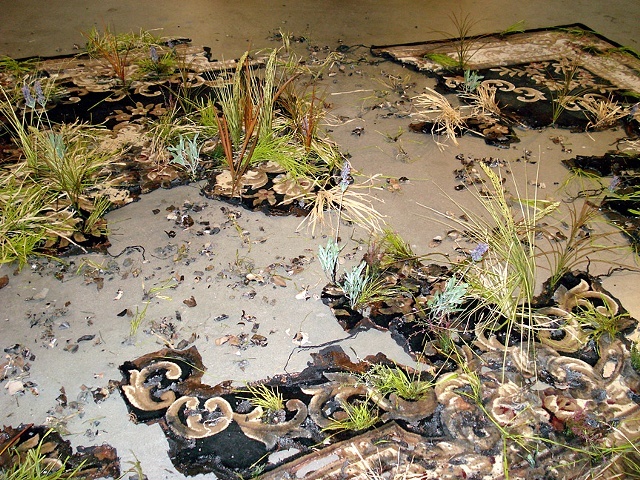 Here, Hegarty turns an imitation Aubusson rug into a scenario of deterioration, fecundity and foliage. Turf, grass and plants appear to reclaim the rug due to neglect. Created as lovingly as Albrecht Durers watercolor Great Piece of Turf, each blade of grass was hand sewn, each hole cut with an eye to composition, creating in essence a landscape painting on the floor. Patches of grass emerge through various parts of a rug, giving the indication that nature is fighting a guerilla war with man. With this and with all the works, Hegarty uses the devices of landscape painting to create narratives that are compelling both visually and poetically. By creating depictions of cultural objects rearranged by nature, Hegarty lets the silent witness of the landscape assert its voice in a sometimes gentle, sometimes violent anarchy.